Still standing on the west side of Sherbourne just south of Bloor Street East is the James Cooper Mansion. Built in 1881, the house is of the Second Empire architectural style with a distinctive mansard (double-gable) roof. (See the City of Toronto Reasons for Designation of 582 Sherbourne Street PDF for details on why the house is designated under Part IV of the Ontario Heritage Act.) Mr Cooper was a founder of Sessions, Carpenter and Company, manufacturer and importers of shoes and boots. Over time, Sherbourne lost its high end status, and the house was sold to the Keeley Institute for Nervous Diseases (helping people with alcohol and substance abuse problems). In 1910 it was sold to the Toronto Knights of Columbus who built an assembly hall connected to the house. 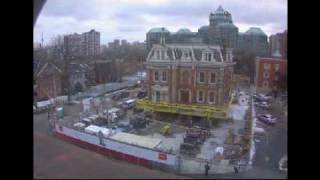 Most recently, the entire property was sold to the Tridel development corporation who moved the 800 ton house east towards Sherbourne to make room for the 32 storey tower which they named "James Cooper Mansion".